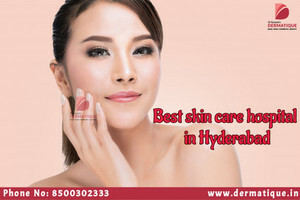 Dermatique is best skin care hospital in Banjara Hills and an exclusive place for a wide range of services and treatments for skin, hair, nails, laser treatment, hair transplantation etc. This is the one stop solution for all your needs our physician there examine your skin tone and guide you on the best available treatments that help in achieving rejuvenated and young looking skin. The methods are performed by highly skilled professionals in a safe and effective result are seen.